There is arguably no other breakthrough that has transformed society as much as the discovery of electricity. The ability to harness its power was the catalyst for the Second Industrial Revolution, which saw electricity replace steam as the main power source in industry. In the 1800s, electricity revolutionised transport and communications and led to inventions such as the lightbulb, telegraph, and electric-powered trams, trains and underground systems, which were much faster than their steam- or horse-driven counterparts. Today, it is hard to imagine a world without electricity, as we rely on it for nearly everything. Anyone who has ever desperately ransacked the house for candles or sat staring at a blank television screen during a power cut can attest to this. When electricity was first introduced into domestic settings in the 1880s, it was primarily used for lighting. One common approach for other appliances (such as vacuum cleaners, electric fans, smoothing irons and curling tong heaters) was to connect to light bulb sockets using lampholder plugs. In Britain, there were recognisable two pin plugs and wall sockets appearing on the market as early as 1885. As electricity became a common method of operating labour-saving appliances, it was evident that a safer and better way of connecting to the electric system was required. This thought was shared by two electrical engineers: Charles Leonard Arnold and Charles Reginald Belling, who at the time were in business selling electrical fires under the name Belling & Company. It was Belling who pointed the way forward, realising that his fires and other electrical equipment appearing on the market in ever-increasing volumes would require high quality and high-rated sockets and switches, and so The Heavy Current Electric Accessories Company was born. The company was based on the Multy Kontact socket, patented by Charles Arnold. Before the Multy Kontact, most available sockets were split pin-style sockets that were primarily made from thick gauge slotted brass tubes, offering practically no flexibility. Plug pins were split to allow compression, but poorly made small pins would often produce a loose fit and poor contact. Large pins, on the other hand, needed too much force to insert and remove them. Flowery language aside, the Multy Kontact was safer and easier to use than anything else on the market at that time. As a result, the British Engineering Standards Association (BESA) revised its standards in line with the levels of self-adjustment and contact-making that the Multy Kontact established. Other manufacturers were forced to update their products to meet these new, stricter requirements. In 1928, further safety advancements were made with the invention of the shuttered socket which concealed the live and neutral contacts when the plug was pulled out of the socket and eliminated the alarming ‘flash’ that invariably accompanied plug withdrawal from old fashioned sockets. The devastation of the Second World War encouraged progress in many areas of society, including the establishment of universal healthcare and the birth of the NHS. The massive programme of building required after the war also presented the opportunity to improve and standardise wiring and electrical outlets with updates to the British Standards. The British ring final circuit system and BS 1363: 13 A plugs, socket-outlets, connection units and adaptors plug and socket-outlet system were introduced into the UK in 1947, following many years of debate by ‘The Electrical Installations Committee’ of the IEE, which was formed by the Minister of Works and Planning, Lord Reith. Over the years there were ongoing efforts to improve electrical safety, catalysed by the introduction of the Plugs and Sockets etc. (Safety) Regulations in 1987. 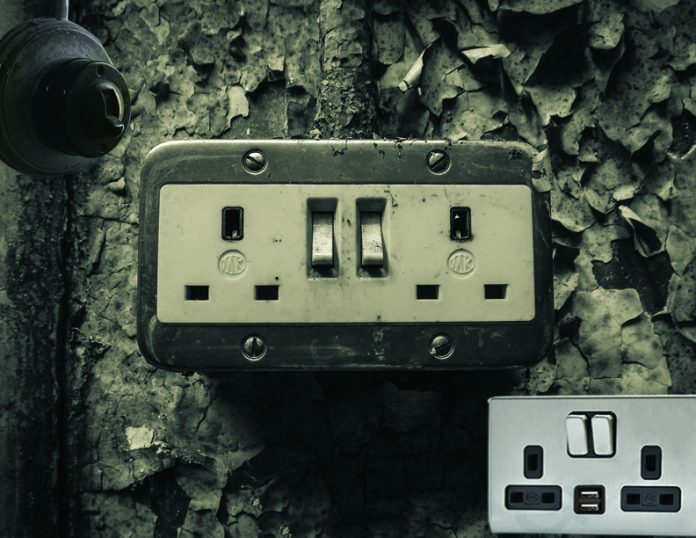 MK Electric evolved its shuttered socket design and developed Logic PlusTM – a range of wiring devices which are widely regarded as most advanced and safest on the market. In 1947, nobody could have anticipated the impact that the technological revolution could have had on the electrical industry. The proliferation of the internet caused an influx of mobile devices, all with different plugs and charging requirements. This led to the inclusion of USB charging ports into socket outlets to provide a convenient, universal charging solution for all types of devices. USB sockets with Dynamic Device Recognition (DDR) technology are better and safer because DDR ensures that the device recognises the socket as it would its own charger and draws current in the way that best suits its design. This ensures optimal and efficient charging for any device. The contemporary socket outlet may be worlds away from the original split pin design, but one thing remains true: electrical sockets are an essential part of modern life, enabling us to access the dozens of different electrical devices we use every day.